Are you trying to get a comfortable spot on your old mattress but don’t have the cash to buy a new one? You can get a mattress topper which is less expensive – not a long-term solution to your old lumpy and sagging mattress – to improve the quality of your sleep. A mattress topper is a soft extra layer placed on top of the mattress to give you a softer surface. Toppers are made using different materials like memory foam, latex, polyfoam, wool, and natural feathers. There are different mattress toppers that you can get to improve the quality of your sleep. For back sleepers, a good topper will make your bed firmer and give you more back support. For front sleepers, it will give you a softer surface, and for side sleepers, a bed that isn’t too firm or too soft for relief on your pressure points. For those who find it hard to sleep because you’re either too hot or cold, a breathable memory foam topper will help regulate your body temperature to give you a comfortable night. Here are some of the best mattress toppers you can get for your bed to help you sleep better. Made from aerated natural latex, this Plushbeds topper is exceptionally durable with a longer lifespan than other topper made from other materials. You can get it in 2-inch, 3-inch, or 4-inch thickness with a firmness of soft, medium, medium firm, and extra firm to cater to all your sleeping preferences. The latex helps to align your spine as it molds to your body curves to provide support which makes it perfect for sleepers with shoulder, neck, and back pains. Its breathable top cover and good interior airflow keep you cool throughout the night. And it also isolates your movement on the bed to avoid disturbing the other person in the bed. Most mattress toppers are either 2-inch or 3-inches, but this lucid mattress topper is thicker. It’s made with memory foam infused with gel which absorbs your body heat to keep you cool and comfortable during the night. Its thickness makes it an excellent futon for any unexpected guests. This is a soft, airy, and fluffy topper that will give you extra cushioning and relieve pressure points. It’s filled with microfibers that are evenly distributed to make your bed fell softer and more comfortable. It required to be dry cleaned and the feathers can at times poke you. If your bed is too firm and you want a softer surface, this topper is an excellent choice. Made with eco-friendly breathable material and an organic cotton cover it will regulate your body temperature keeping you cool and sweat free during the night. It provides adequate support and hugs your body curves to prevent sagging and reduce discomfort in your shoulders, neck, and lower back. The topper has a gel-infused foam and a breathable rayon cover made from Bamboo to absorb minimal body heat making your bed a cooler place to be during the night. This topper will conform to your body contours and align your spine to relieve you of any pain and pressure on any part of your body. This is a luxurious soft but dense topper that provides a softer but supportive surface to a firm bed. This topper will envelop your body perfectly and give you more cushioning. And you don’t have to worry about waking up sweating in the middle of the night. It also has a removable cover that you can easily wash. This is an eco-friendly latex topper that is durable with a long lifespan. For hot sleepers, this is a good choice because it will regulate your body temperature making sure your body temperature stays neutral while you sleep. The aerated natural latex interior and the breathable organic cotton cover helps air circulate freely to cool you down at night. 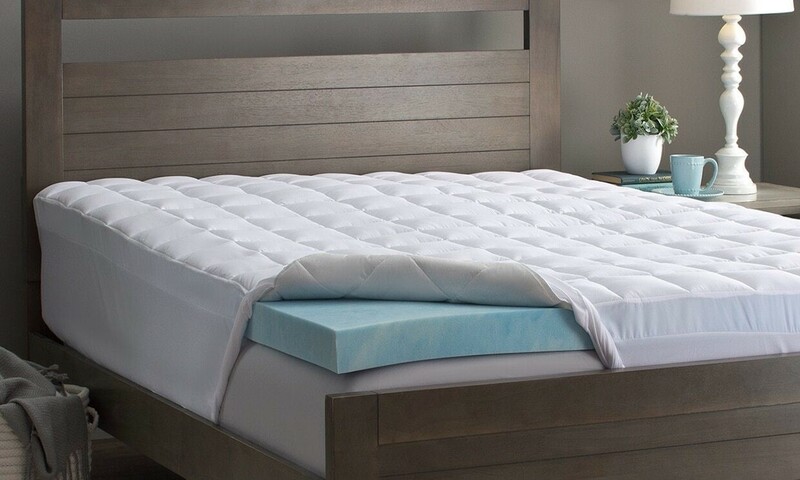 This 5-inch featherbed mattress topper will give you excellent support and relieve pressure points to help you relax and have a good night’s sleep. It’s filled with natural feathers and a pure cotton cover making it the perfect topper if are going for a more traditional approach. This memory foam topper will add extra padding and support to your bed while still giving you that sinking enveloping feeling. The small circular spaced perforations on this topper help you to sleep cooler through the night. It’s very light and easy to move, however, you need to buy a waterproof cover since it doesn’t come with one. This convoluted or egg-crate polyfoam has small ridges that support your body and evenly distribute your weight. It’s a 3-inch topper made from a dense, long-lasting foam that withstands sagging for longer giving you ample body support even for people who are heavier. The shape of this topper hugs your body and provides pressure relief to your shoulders, neck, hips, and lower back. This topper is made from organic merino wool which is good material in regulating temperature. Your body temperature will be well-regulated and you won’t have to sweat through the night. It’s a suitable topper to be used by all sleeping positions. This topper will provide you with ultimate comfort. It will regulate your body temperature to give you a better sleeping experience. This 5 cm memory foam will absorb your movement on the bed to avoid waking your partner and evenly distribute your weight to reduce pressure on your joints for a more comfortable night. It’s also a good investment if you want to prolong the lifespan of your bed. A mattress topper is a good investment if you want to have a more comfortable bed. It also improves the lifespan of your current mattress.